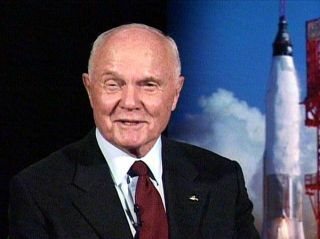 John Glenn on Feb. 20, 2002 -- the 40th anniversary of his Project Mercury flight aboard Friendship 7. FamedMercury astronaut John Glenn has an open seat at his lunch table, providedyou?re willing to foot the bill. Glenn, the firstAmerican to orbit the Earth, is offering an afternoon lunch as part of acharity auction for the Astronaut Scholarship Foundation, which is raisingcollege scholarship funds for aspiring engineers and scientists. It was 50years ago today that NASA unveiled Glenn and the six other Mercuryastronauts - the country's first spaceflyers - to the world in afrenzied press conference that made the seven men instant national heroes. Onthat April 9 in 1959, Glenn compared his feelings for spaceflight to those ofthe Wright Brothers as they prepared for their history-making air flights. ? ?I think westand on the verge of something as big and as expansive as that was fifty yearsago,? Glenn, now 87, said in that briefing according to NASA?s transcript,adding that he and the other Mercury astronauts felt lucky and blessed to bepart of it. ?This can mean an awful lot to this country, of course.? At thetime, the United States was embroiled in a Space Race with the former SovietUnion, one that culminated in the Apollo missions that landed Americans onthe moon in the late 1960s and early 1970s.Since then, more than 300 NASAastronauts have followed, with another 10 or 12 expected to join the agency?sspaceflying corps in a few weeks? time. But Glenn andhis fellow Mercury astronauts - Alan Shepard, Gus Grissom, Scott Carpenter, Donald"Deke" Slayton, Walter Schirra and Gordon Cooper - have been thepopular image for America?s past and present astronaut corps. Five of the sevenhave passed away in the last five decades, with Glenn and Carpenter all thatremain. Glenn first launchedinto space in 1962 aboard his Mercury capsule Friendship 7. It was America?sthird manned spaceflight after the suborbital trips of Shepard and Grissom, butthe first to reach orbit and he circled the Earth three times before landing. In 1998,Glenn launched into space again at age 77 aboardNASA?s shuttle Discovery, setting a world record for the oldesthuman to fly in space. Unlike his first flight, Glenn spent nine full days inspace performing experiments to investigate spaceflight and the aging process. Healso served as a senator for his home state of Ohio for 24 years beforeretiring in 1999. TheAstronaut Scholarship Foundation?s last lunch date with Glenn fetched a cool$6,050 during a 2008 auction. But the experience is not the only one up for sale.Seven other astronaut experiences are for sale - including a meal with Carpenter- and other astronaut memorabilia are also up for grabs to benefit thefoundation?s scholarships. While theonline bidding for the foundation?s auction opened Thursday, it runs throughApril 18. Clickhere for more information via the Astronaut Scholarship Foundation.